Music in casinos isn’t a random compilation of ad hoc songs or a playlist found online. Rather, the music you hear in casinos is selected, handpicked and strategically played. If you have ever paid attention or listened closely to the music playing while you play your Blackjack hand, you may have noticed it is very calm, soothing, almost boring music. This seems bizarre for a place that is supposed to be fun, doesn’t it? Not really- your favourite casinos pick this music to soothe you right into spending your money. Casinos understand the ways that buzzing sounds, dinging, loud sounds and bright, flashing lights trigger and impact our mental state and over psychological state and try to offset this using calm music. In addition, the more relaxed the music makes you, the more money you are likely to spend and the less likely you are to be in a rush to leave the casino. Conversely, face paced music has proven to make people spend money more quickly and bet at a faster rate. Therefore, there may be an increase in fast paced music over the course of the next little while- your favourite casino may soon sound and feel like a club. It has been noted that these loud noises are helpful to a full sensory gambling experience for players. 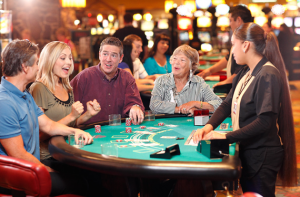 Different players appreciate different experiences within casinos. Music helps contribute to the positive feedback loop that helps with addictive properties of gambling and games. Players should be aware of their surroundings and understand their limits and play within them, however, it is not wrong to take in all the sights and sounds at the casino and enjoy a fun night out with friends, family or alone. From the gambler’s perspective, neither fast-tempo hits nor soft Muzak is the sound of choice.